Always reach on time at your destination at perfect time with Ricoh Sordi set of 3 watches. The watches are specially designed for men, the straps are made up of leather. Leather is always durable and comfortable for the regular use. The watch comprises of round shaped black and silver dial which is quite big in size hence enables you to see time clearly even in dim light. For a better toughness and durability dial is composed of stainless steel. The watch is very light in weight as it weighs only 300 grams. It's a good gifting stuff for your loved ones also. Always reach on time at your destination at perfect time with Ricoh Sordi set of 3 watches. 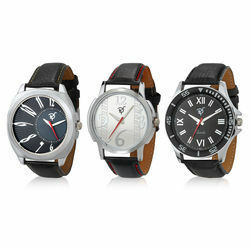 The watches are specially designed for men, the straps are made up of leather. Leather is always durable and comfortable for the regular use. The watch comprises of round shaped black and silver dial which is quite big in size hence enables you to see time clearly even in dim light. For a better toughness and durability dial is composed of stainless steel. The watch is very light in weight as it weighs only 300 grams. It's a good gifting stuff for your loved ones also.